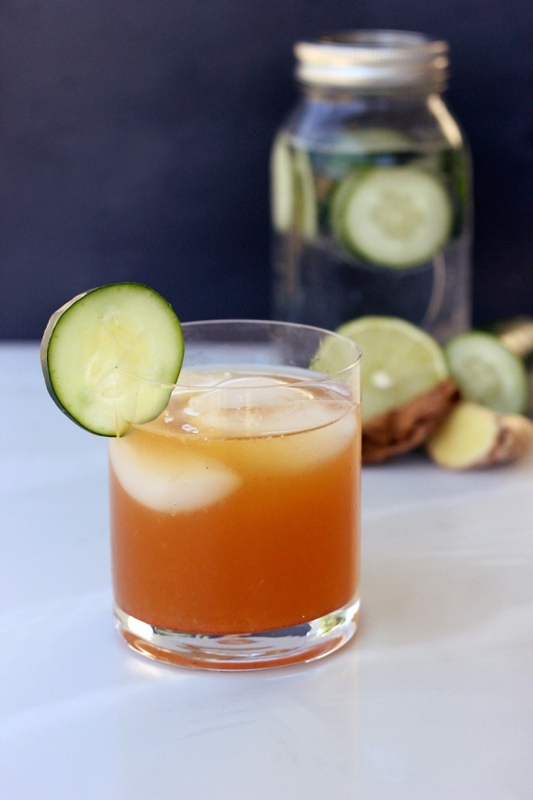 The final post in our series of summer mocktails from Beth of Tasty Yummies! Creating this 5-part series of mocktails for Free People has been such a delight. Each week it has provided a much different than normal creative challenge, which has allowed me to look at foods and ingredients in a unique way from my usual cooking and baking. I have also loved the challenge of creating unique drinks without alcohol, sugar, mixes or any other stuff. I hope all of you have enjoyed the drinks as much as I have enjoyed making them. For this final drink I decided I had to collaborate with my good friend, Brian Kruglak, for a unique mocktail to end things in style. Brian is an incredibly talented bartender that moved to Buffalo about 9 months ago from DC and he has been sharing his creative cocktails all around the city since. When I told Brian that I was looking for something unique, with a spicy kick and not too sweet, he reminded me of an incredible cocktail that he had created that I tried about a month ago: Death of a Matador, he calls it. We worked on the recipe together to tweak it to make it perfect as a non-alcoholic cocktail sans refined sugar and I think it is just as incredible. There is a subtle smokey spice from the chipotle, a nice tart flavor from the lime, a kick from the ginger and the cucumber and green tea rounds it all out nicely. I infuse ice water with cucumbers all summer long (it is my absolute favorite) so any drink that celebrates that is wonderful to me. This version infuses soda water which is equally as delicious. Whatever you don’t use in this cocktail will be delicious and refreshing on its own. Be careful though, cucumber water is addicting, haha! The alcoholic version is made by skipping the ground chipotle when muddling and instead using a chipotle infused tequila. If you are a drinker that loves a unique cocktail with a punch, this is your drink. I promise. If you want to find Brian in Buffalo to make you an incredible cocktail concoction, you will find him behind the bar at Buffalo’s newest restaurant Kaydara Noodle Bar. Thank you so much to Free People for inviting me to share this series of summer mocktails, it has been an absolute pleasure! * Optional to make a “spirited” version: instead of muddling the ground chipotle pepper, infuse Epsolon tequila (that is Brian’s favorite, you can feel free to use your favorite blanco tequila) with chipotle peppers. Place six whole dried chipotle peppers in a tightly sealed jar with the tequila and let sit for five hours. Then strain. 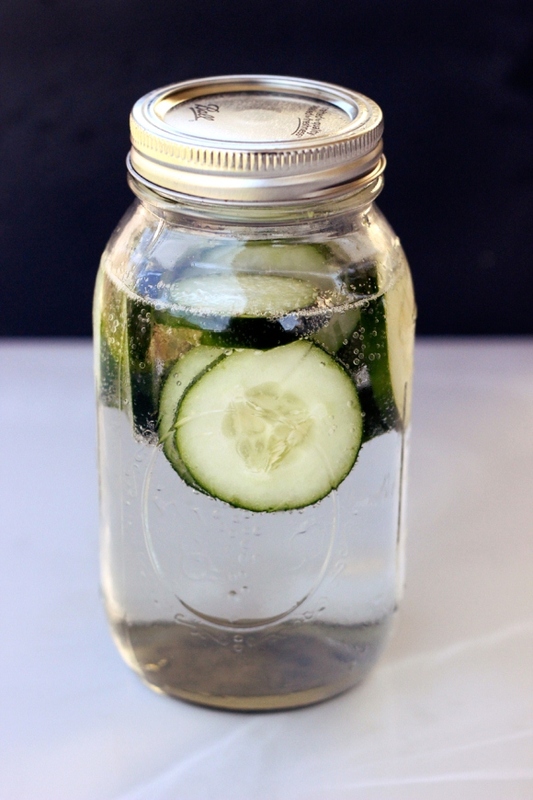 First, you’ll want to infuse the soda water with the cucumbers. Slice the cucumber into about 1/4-inch thick slices and add all but 4 of the slices to a glass jar and fill it with soda water. Place in the fridge for about an hour or so. 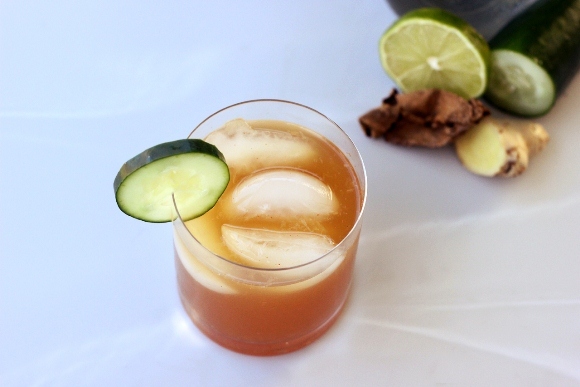 When you are ready to make the drink, in a sturdy glass or cup, muddle together the ginger with 3 cucumber slices, the lime wedges and a pinch of ground chipotle pepper plus 1 tablespoon of coconut sugar or raw sugar. Top with 1/2 cup chilled green tea and ice (if making alcoholic leave out the ground chipotle pepper and add in 1.5 oz of the chipotle infused tequila now), cap the glass with a cocktail shaker, and give it a good shake for about ten seconds. Pour into your serving glass, add ice and top with the cucumber infused soda water and a cucumber garnish. For more of Beth’s delicious recipes visit her blog Tasty Yummies! This is unrelated, but I finally got the courage to cut off my extreme vintage flares to the correct length, and sadly my new fringe edge is not nearly as pretty as the original. How exactly did you guys get the finished fringe on the Extreme flares? It was very light blue, fuzzy, soft. Now my fringe is mostly white and dark blue hanging threads. It’s just not nearly as nice looking. 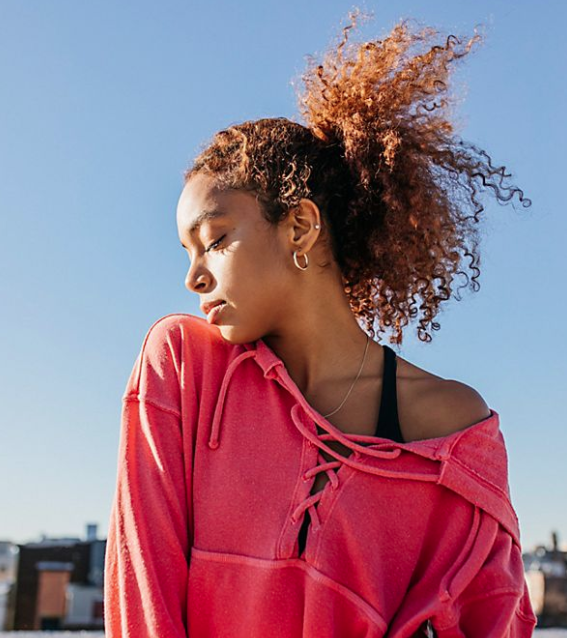 Just curious if you knew how to re-achieve the original look/feel. I have been exploring for a little for any high-quality articles or blog posts on this sort of area . Exploring in Yahoo I at last stumbled upon this web site. Reading this information So i’m happy to convey that I’ve an incredibly good uncanny feeling I discovered exactly what I needed. I most certainly will make sure to don’t forget this web site and give it a glance on a constant basis.